It isn't too hard too tell that these birds are ducks. The bird on the far left side of the photo has a rusty brown head, dark chest, and medium grayish back. The head color might suggest a female Common Goldeneye, but the lack of a white or gray collar eliminates that species. This bird is a drake Redhead. 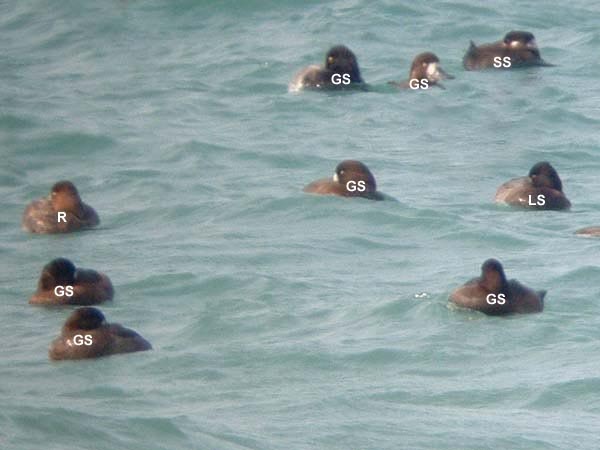 Directly below the Redhead are two rather uniformly dark brownish ducks with white at the base of the bill. The heads of both of these birds are full and round, lacking a peak or crest. This combination of characters looks good for female Greater Scaup. Moving counterclockwise, the bird in the lower right of the photo also looks like a female scaup, but since we can't quite make out the head shape we can't be entirely sure which scaup it is. We'll just have to let this one go, though the bird is probably a Greater. Moving on, the duck above and to the right of our unspecified female scaup has a gray back contrasting with a darker chest. The head also looks dark, and, more importantly, has a distinct peak on the rear of the crown. This bird is a male Lesser Scaup. Directly to the left of the Lesser Scaup is another female Greater Scaup, nicely showing the full, round head of this species. Directly above this bird is what looks like a male scaup, with its pale grayish back and dark head. The exact head shape of this bird is a bit difficult to ascertain, but it appears to be round and doesn't have a peak. This bird is a Greater Scaup. To the right of the male Greater Scaup is another female Greater Scaup, showing the prominent white blaze at the base of the bill and the pale cheek patch that are typical of this species in female plumage. Lastly, we have the bird in the upper right corner. This duck looks darker overall than the other ducks in the photo, but the most prominent feature is the squarish, flat-topped head with a white nape. The head shape is good for a Surf or White-winged Scoter but only Surf has a white nape. This is a Surf Scoter, probably a female. This group of ducks was photographed at Illinois Beach State Park on October 30, 2005.